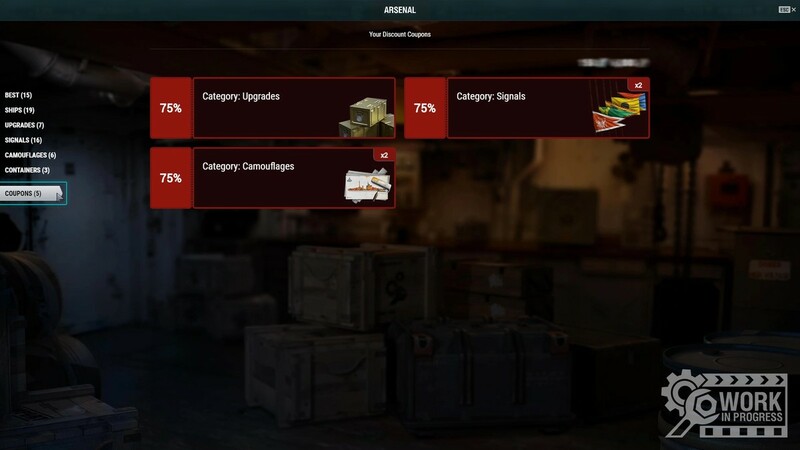 Update 0.7.6 will introduce the Arsenal—a special place where you can exchange Coal and Steel for signals, camouflage, ships, containers, and special upgrades. You can find the Arsenal in the upper left corner of the Port interface, above the list of available Combat Missions and Challenges. Coal and Steel are new in-game resources that you can earn by completing different Combat Missions, achieving high ranks, and getting good results in Clan Battles. Coal can be earned through different Combat Missions and found in daily containers. 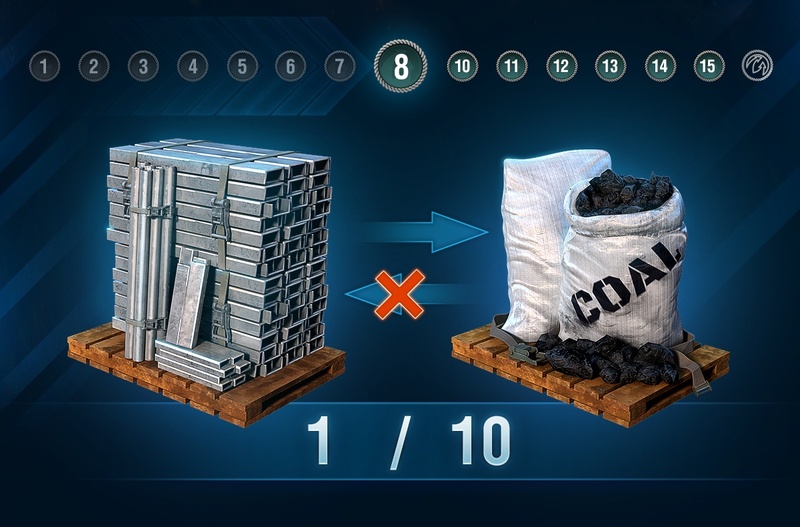 Coal will drop from daily containers with a specific chance and will replace the contents of one of the three slots. Alternatively, it can drop from the Try Your Luck containers. The More Credits, More Signals and Camouflages, and More Consumables containers can bring you 300 Coal. The Try Your Luck container—700 Coal. Supercontainers can reward you with 15,000 Coal. Follow the news to learn how you can earn Coal in July. At the moment, Steel will be given for completing Combat Missions in Clan Battles; in future, you'll be able to earn it in other battle types. In addition, 1,500 Steel can be obtained from Supercontainers. You can exchange Steel for Coal at a rate of 1:10. A reverse exchange—Coal for Steel—is impossible. The Arsenal becomes available at Level 8 of the Service Record. This section allows you to replenish your stock of camouflages for your ships. The following types will be available in 20-piece sets: Ocean Soul, Revolutionary, Frosty Fir Tree, Back-2-School, Team Water – Clash of the Elements 2017, and Team Fire – Clash of the Elements 2017. The price will vary between 5,200 and 16,000 Coal for a set. Here you can purchase all the base combat and economic signals in 20-piece sets, with prices ranging from 800 to 12,800 Coal for a set. You can purchase the following ships using Coal: Oktyabrskaya Revolutsiya (53,500), Aigle (49,500), Yubari (25,500), Musashi (176,000), Salem (240,000), and Campbeltown (19,500). Steel will get you Flint (11,600) and Black (14,000). 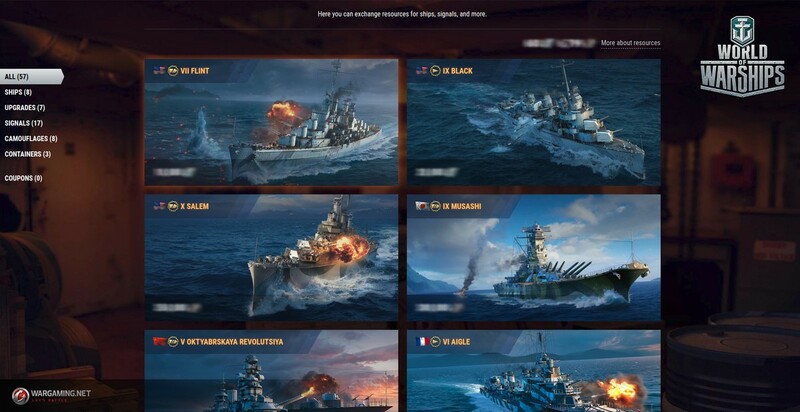 Tier X cruiser Stalingrad will join these ships in Update 0.7.8 and will cost 28,000 Steel. If you purchase a ship that you already have in your Port, its price in credits will be transferred to your account. Each ship comes with a 3-point Commander and a Port slot. Collection containers Hunt for Bismarck (5,000), Vive la France (12,000), and Dunkirk (5,000) will help you complete the corresponding collections and replenish your stock of special signals and camouflages. They are available in 5-piece sets. Here you can find all the special Upgrades: Spotting Aircraft Modification 1, Damage Control Party Modification 1, Engine Boost Modification 1, Hydroacoustic Search Modification 1, AA Defensive Fire Modification 1, Surveillance Radar Modification 1, and Smoke Generator Modification 1. Each unit costs 17,000 Coal. Coupons are a separate section of the Arsenal. Use the Coupon section to activate a discount for different items from the Arsenal! Each coupon can be applied to only one category and only one item from this category. Discounts don't stack: only one can be used at a time. Each coupon has a validity period. Some coupons will have multiple uses—some time after the first use, the coupon will be restored and you will be able to redeem it again. Each coupon will have a timer on it informing you of the time when the next coupon is available. Apart from this, a special icon will appear on the Coupons tab to let you know about new coupons. The time until new coupons are available will be displayed only after you spend all the coupons in this category. 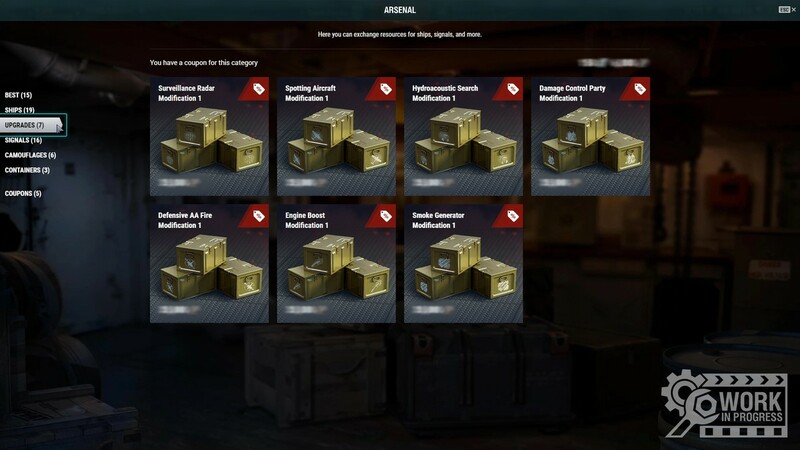 Players who earned certain merits in battle won't have to accumulate Steel and Coal from scratch, because we thought about some bonuses for them dedicated to the Arsenal's launch. 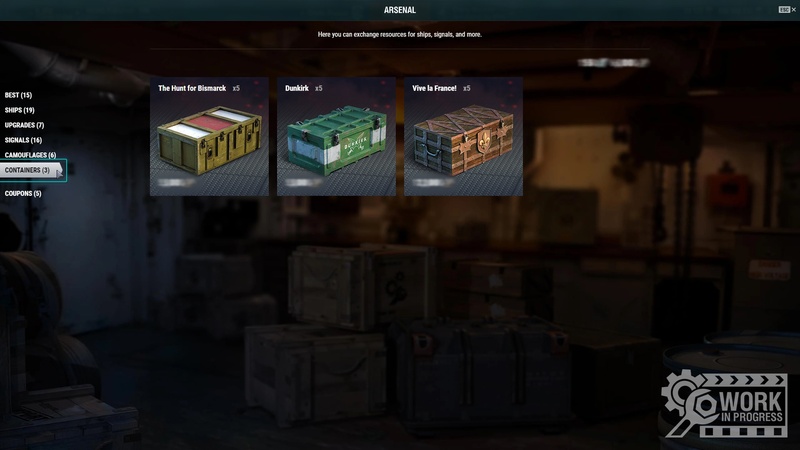 Firstly, when the Update with the Arsenal releases, players will receive a nice bonus for the Oil they have in stock—5 Coal for 1 Oil. After the release of Update 0.7.6, Oil is used only to build Naval Base objects and gain access to constructions. One first rank: 2,500 Steel. Two first ranks: 5,000 Steel. Three first ranks: at this stage, players previously received Tier VII ship Flint, that's why there's no bonus for them in this case. Four first ranks: 5,000 Steel. There is no bonus for the previous ranks, because players have already received Flint for them. Five first ranks: at this stage, players previously received Tier IX ship Black, that's why there's no bonus for them in this case. Six first ranks: 2,500 Steel. There is no bonus for the previous ranks, because players have already received Flint and Black for them. Seven first ranks: 5,000 Steel. There's no bonus for ranks 1-5, because players have already received Flint and Black for them. Eight first ranks: 7,500 Steel. There's no bonus for ranks 1-5, because players have already received Flint and Black for them. Thus, players who achieved the first rank two or four times can exchange Steel for Flint or Black if they achieve the first rank in the next season. 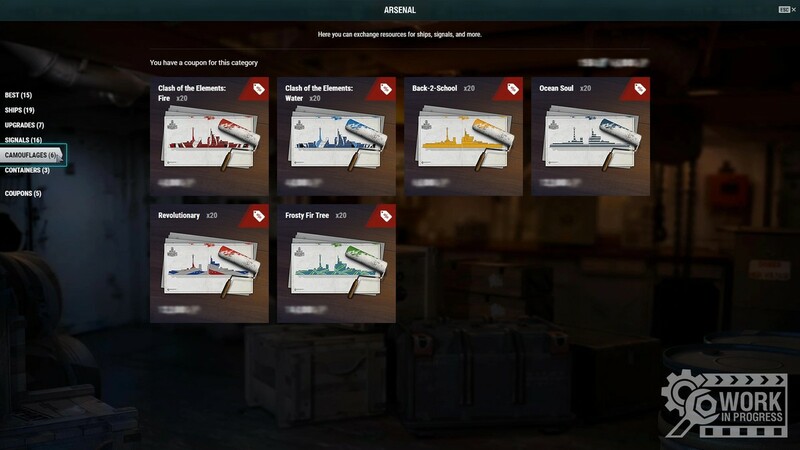 Thirdly, with Update 0.7.6 all players will receive different coupons, including one providing a 25% discount in the Ships category. If you participate in Clan Battles, you will receive 6,000 Steel for each of the two Stalingrad flags. The flags will be written off your account. 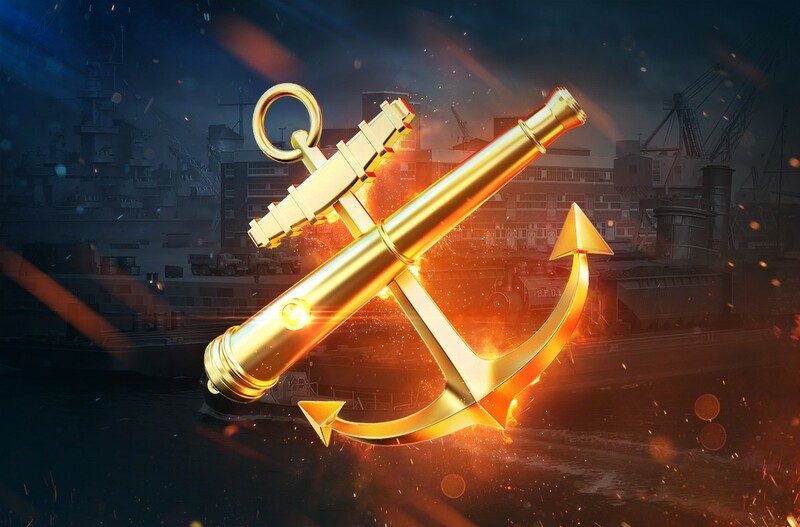 For the third clan season, players who scored 30 victories in the Typhoon League will be able to receive 10,000 Steel, which allows them to accumulate the necessary amount of resources to get Tier X cruiser Stalingrad in Update 0.7.8. Thus, players who earn three Stalingrad flags will be able to exchange 21,000 Steel for Tier X cruiser Stalingrad. 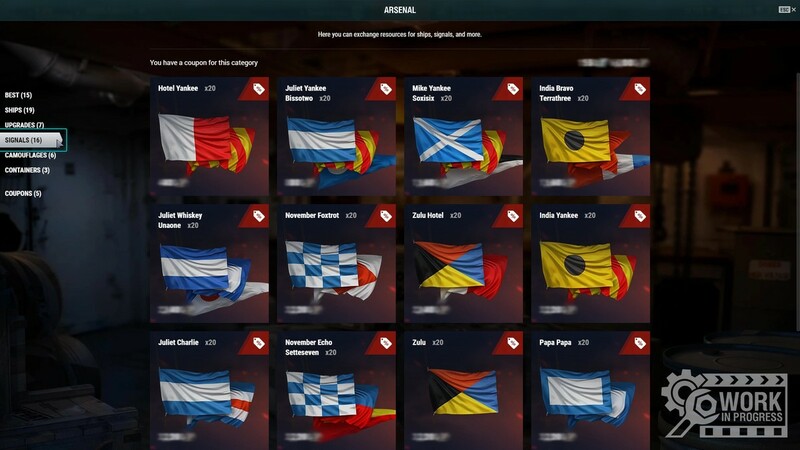 Two weeks after the release of Update 0.7.8, if you earned three Stalingrad flags and used your coupon to obtain cruiser Stalingrad, another coupon for a 25% discount in the Ships category will be credited to your account. 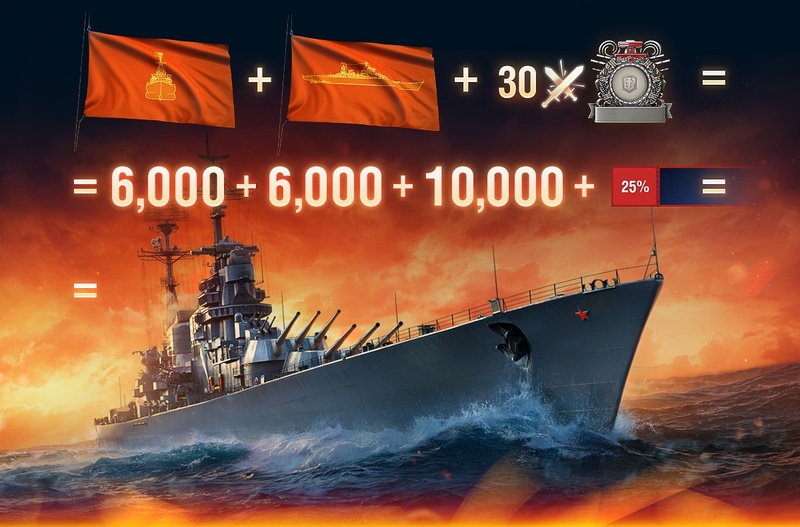 Pay attention, if you fought in three Clan Battles seasons in order to earn Stalingrad, don't spend your coupon and Steel on other ships, otherwise you'll need to accumulate the necessary amount of Steel to purchase the cruiser without this discount. We also want to reward our players who achieve the first rank and the Typhoon League on a regular basis. That's why you will get a special token for each first rank you have. Having gathered seven of these tokens, you will be able to exchange them for unique camouflages for VII Flint and IX Black. Another type of token will be given for 30 victories in the Typhoon League. 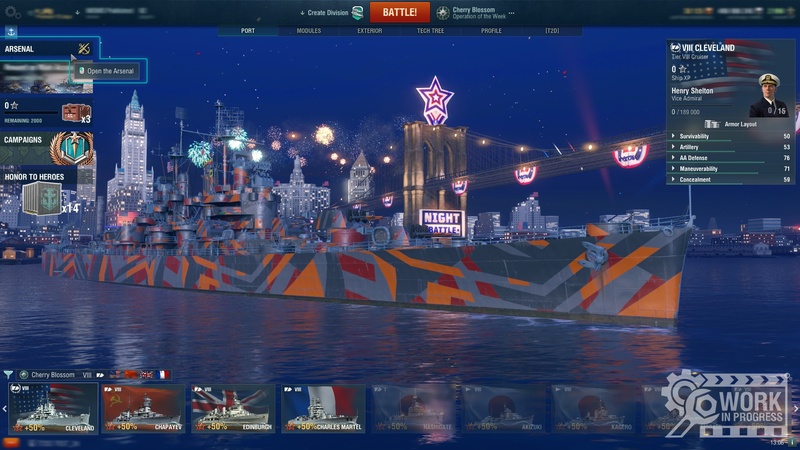 Once you have three tokens like this you can exchange them for a special festive camouflage for cruiser X Stalingrad. This system may be used again in future. Please note that the tokens will not arrive until Update 0.7.8.